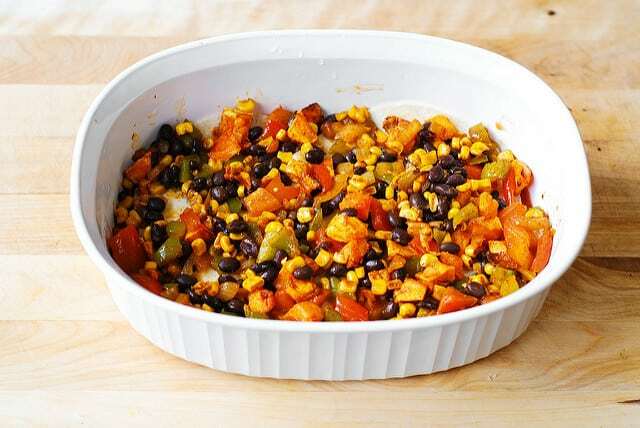 Black Bean and Butternut Squash Casserole – meatless and gluten-free dinner recipe! 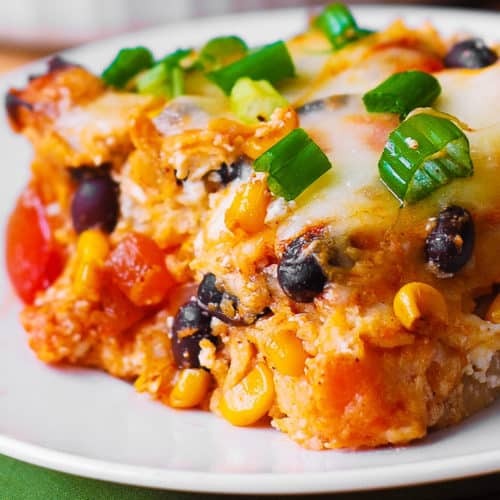 This Southwestern-style enchilada casserole is made with lots of vegetables and corn tortillas. I love making recipes with butternut squash in a casserole dish, such as everyone’s favorite butternut squash and spinach lasagna. Butternut squash is a great vegetable with a rich flavor which works great in meatless recipes! Take a look at beautiful butternut squash tortellini. The vegetables are roasted in spices (cumin and chili powder). That adds lots of Southwestern flavor! Other ingredients include green and red bell peppers, corn, salsa, enchilada sauce, sour cream, Mozzarella cheese, and corn tortillas. This recipe is gluten-free. Use corn tortillas, and all other ingredients are also naturally gluten-free. Use gluten-free enchilada sauce. Keep in mind that some store-bought enchilada sauces can have gluten ingredients. So look carefully at the label. You can also make your own gluten-free enchilada sauce or skip it in this recipe. Store butternut squash casserole refrigerated and covered air-tight for up to 5 days. 1) Heat 1 tablespoon olive oil in a large skillet on medium-high heat. 2) Add chopped onion, chopped green bell pepper and chopped red bell pepper, and seasonings. 3) Add corn to the skillet and roast the vegetables in olive oil on high heat until charred a bit. 4) Add rinsed black beans. 5) Add roasted butternut squash. 6) Mix all vegetables, add more spices and salt, if needed. 7) I used a casserole dish 11 inches x 8.5 inches x 3 inches deep. 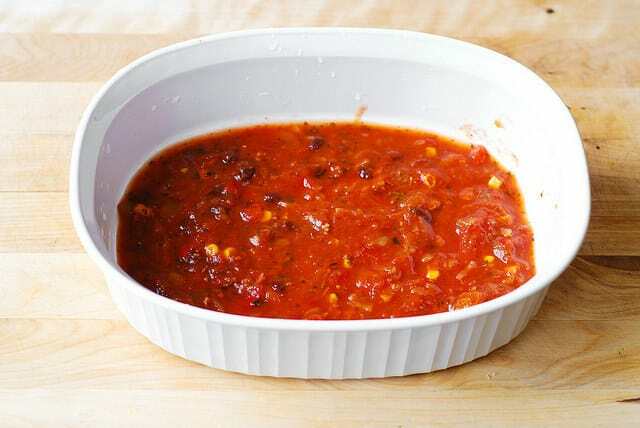 Add 1 cup of salsa to the bottom of the 3-inch deep casserole dish and spread to coat the bottom evenly. 8) Start layers. 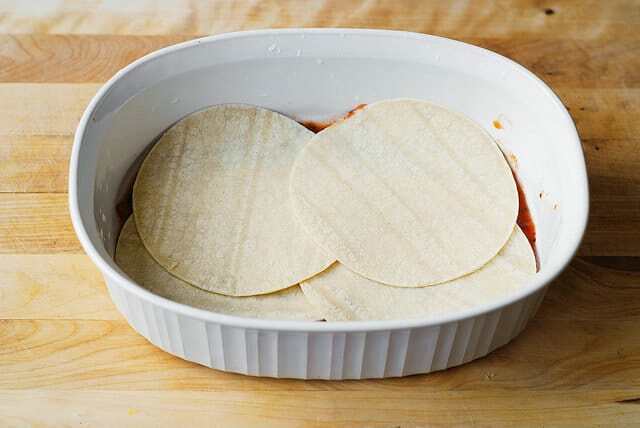 Layer 1: Place 4 corn tortillas over the salsa, overlapping to cover the bottom of the casserole dish. 9) Spread 1/3 of the vegetable mixture over the corn tortillas. 10) Top with 1/2 cup sour cream, dropping it in small dollops all over. Then spread it carefully over the veggies. 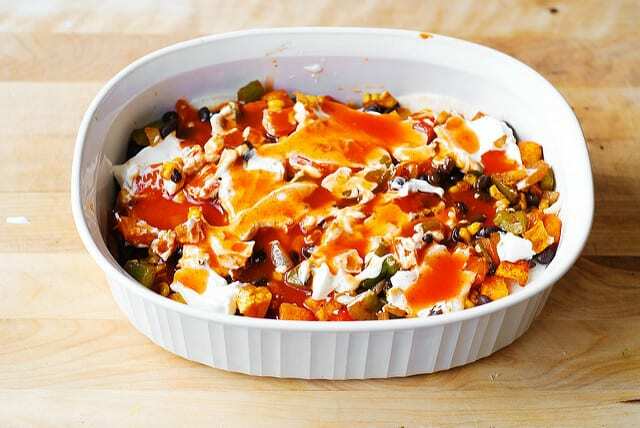 11) Pour 1/2 cup enchilada sauce evenly all over, spreading sour cream evenly all over. 12) Sprinkle with 1/2 cup Mozzarella cheese. 13) Repeat all layers 2 more times. Sprinkle the final layer generously with cheese. Use at least 1/2 and 1/4 cups of Mozzarella cheese. 15) Bake at 375 F in the preheated oven for 25 minutes covered. Then remove foil. Bake for 10 more minutes uncovered. Let it cool a little bit, then slice it right in the casserole pan. 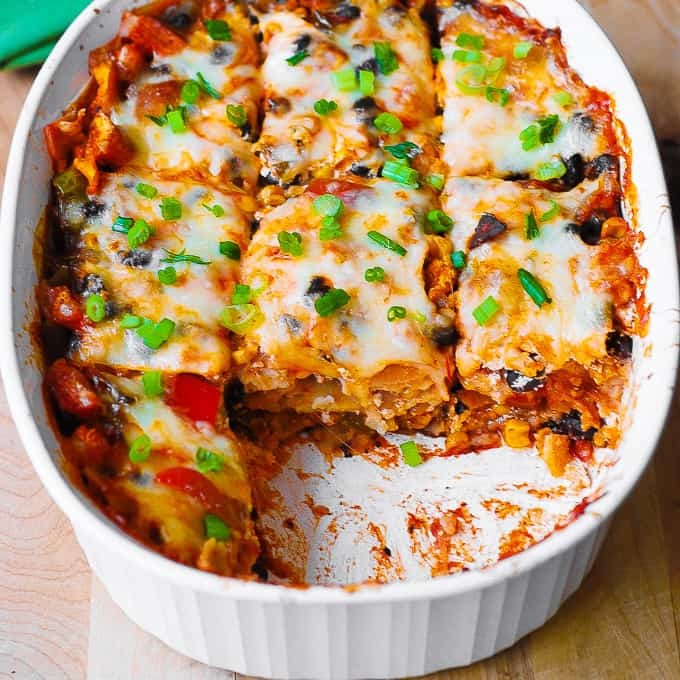 If you love Mexican food or Southwestern recipes, you'll love this Black Bean and Butternut Squash Enchilada Casserole! It makes a perfect weeknight dinner. 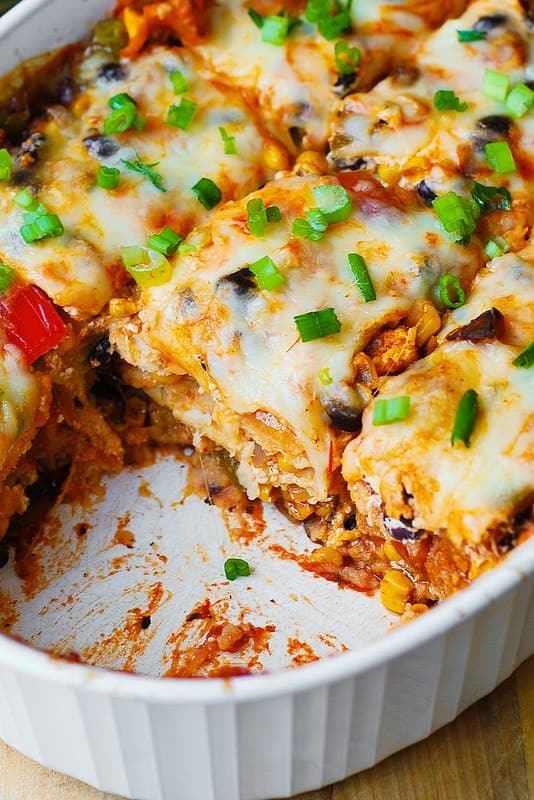 The casserole is made with gluten-free corn tortillas and lots of veggies. Peel the squash and slice it into 3/4 inch cubes. You will only need about 1/2 of the medium size squash. Toss the squash cubes in a large bowl with 2 tablespoons olive oil and generously sprinkle with salt. Place cubed butternut squash on the greased baking sheet and roast for about 30 minutes, until soft. Flip the squash cubes over midway through baking. Let it cool slightly. Heat 1 tablespoon of olive oil in a large skillet on medium-high heat. Add chopped onion, chopped green bell pepper, and chopped red bell pepper, 1 teaspoon cumin, and 1 teaspoon chili powder. Roast the vegetables in olive oil and spices on high-medium heat for about 1 minute, until charred just a bit. Add corn. Add rinsed and drained black beans. Add roasted butternut squash. Season with 1/4 teaspoon + 1/8 teaspoon salt and taste. Add more salt if needed. Add more chili powder or cumin, than indicated in the recipe, if needed. I used a casserole dish 11 inches long x 8.5 inches wide x 3 inches deep. 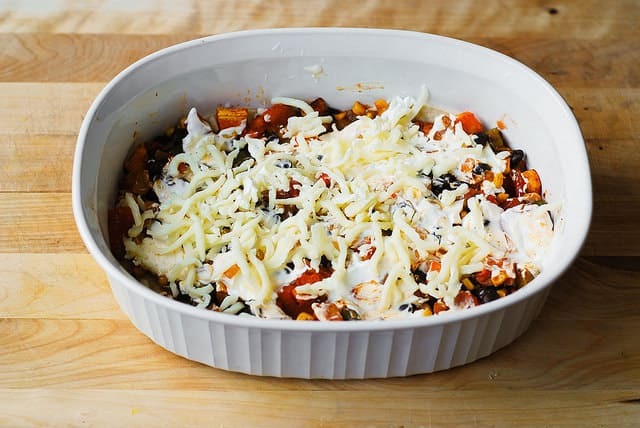 Add 1 cup of salsa to the bottom of this 3-inch deep casserole dish and spread to coat the bottom evenly. Layer 1. Top with 4 tortillas, overlapping to cover the bottom of the casserole dish. Spread 1/3 of the vegetable mixture over the tortillas. Top with 1/2 cup sour cream, dropping it in small dollops all over, then carefully spread it over the veggies. Pour 1/3 cup enchilada sauce evenly all over, at the same time spreading sour cream evenly all over. Sprinkle with 1/2 cup Mozzarella cheese. Repeat the layer described above 2 more times. Total you will have 3 layers. On the final layer, add extra cheese: Sprinkle with 1/2 and 1/4 cups Mozzarella cheese. Bake at 375 F for 25 minutes covered. 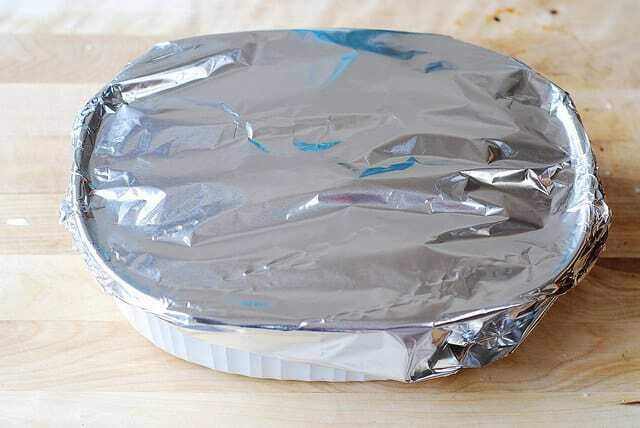 Then remove foil. Bake for 10 more minutes uncovered. When I was getting the packages of frozen butternut squash out of the freezer. I didn’t realize I accidentally added 1 cup of frozen mango to the recipe! Happy Accident!!! This added a wonderful contrasting taste every few bites. Very nice! Wow! 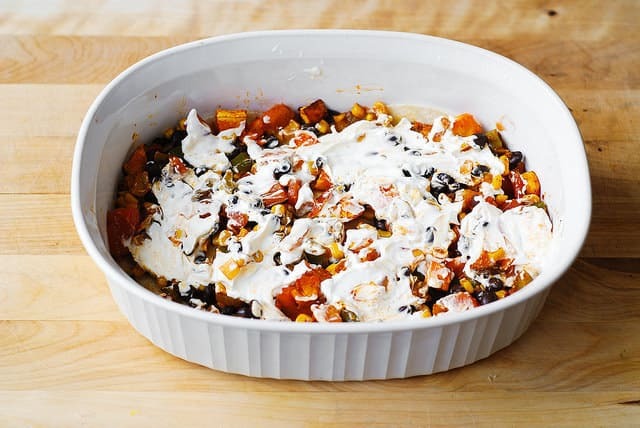 The idea of roasted butternut squash in a Mexican casserole sounded intriguing. 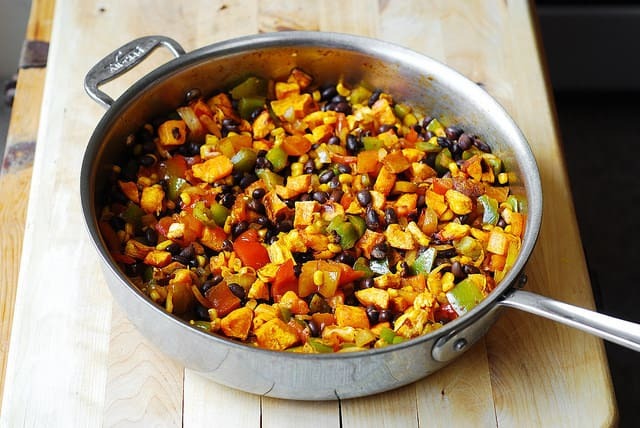 I made a few tweaks and the combination of sweet squash with the Mexican flavors proved to be amazing. I omitted the bell peppers (only because I didn’t have any on hand) and cooked the rest of the veggies as described. I browned some ground turkey with taco seasoning and used just enchilada sauce on the bottom of the dish instead of salsa (again because I didn’t have salsa on hand). I used flour instead of corn tortillas, Greek yogurt instead of sour cream, and mexican cheese instead of mozzarella. 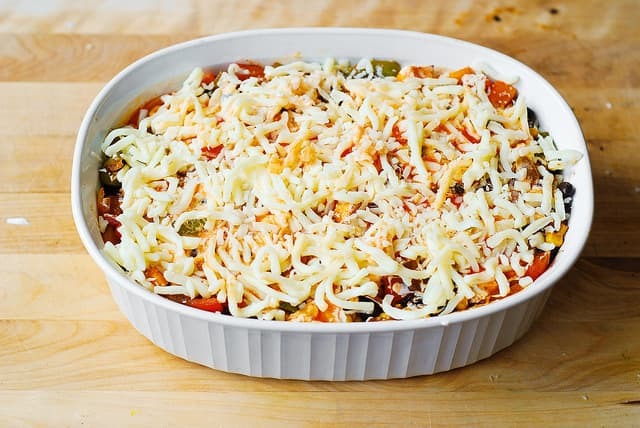 I layered and cooked the casserole as as directed and it turned out absolutely delicious! Will definitely make again! So glad you enjoyed this recipe! Thank you for sharing how you made this dish, including the substitutions. 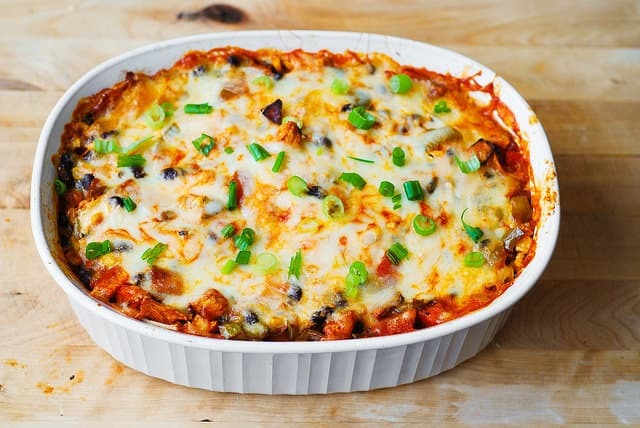 Using ground turkey and Greek Yogurt sounds delicious! Thanks for the recipe. It looks delicious. And thank you so much for a calorie/nutrition breakdown! I really appreciate that. haven’t tried it yet but sounds good One comment is to reduce the repetitive shots of the layers. Just say repeat layers until top layer then top with the finishing ingredients. Make it seem more professionally presented. Thanks for the recipe ; its squash season now that October is here! Yes, this post does have way too many photos! Enjoy the recipe!